Now is a good time to think about aerating your lawn. It is coming up on the height of the growing season for grass, and aerating soon will allow the grass the time to fill in the open areas created by the removal of the plugs. 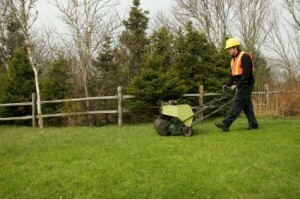 Lawn aeration is the process of removing small plugs of soil from the lawn. This reduces compaction, allowing the soil some space to spread out. It also puts air and water at the roots. This enhances the oxygen levels in the soil and stimulates root growth, given both the space to grow into and the nutrients required. A side benefit is that aeration also enhances the activity of thatch-decomposing organisms. Thatch buildup can be a real problem as it creates both a physical barrier to growth and also blocks out light and air to roots. It is important to properly prepare for an aeration. A few simple steps include flagging any hard to see sprinkler heads or other plumbing components, and watering thoroughly a few days before the service is performed, the extra water helps the process along. Right after aeration is a great time to apply a fertilizer as well, as it has the best opportunity to get down to the root system of grass right after the Aeration.